In online marketing, one of the basic rules is that your landing page should repeat the same offer your visitor saw in the ad. 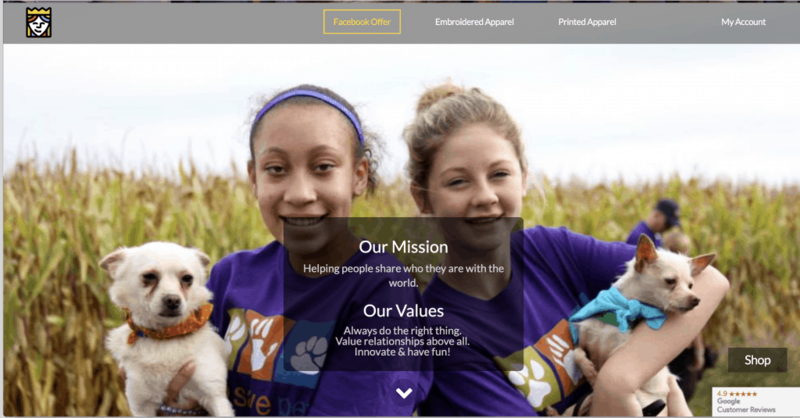 Even more importantly, the landing page’s sole purpose should be to steer the visitor to convert – after all the offer was enticing enough to get them to click. Today I came across an example that seemed to go against the rules. 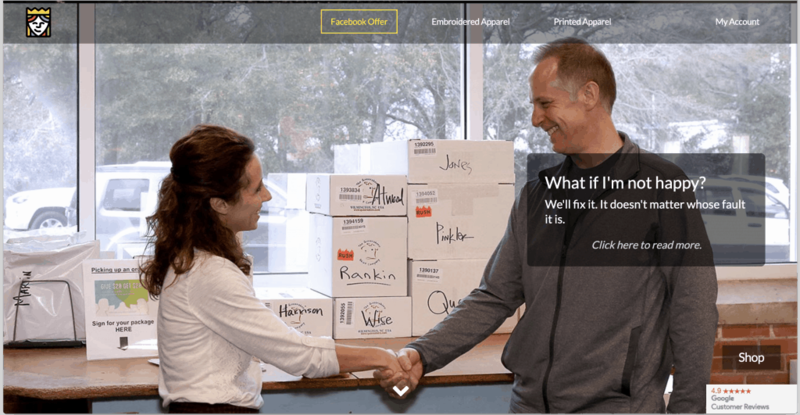 Story of a landing page selling hats – where you cannot buy a hat. I was on Facebook today when I came across an ad for a company selling products with custom embroidery. I thought the offer itself was really good, and I liked the punchy, to-the-point style of writing you often see in PPC ads. I was intrigued, and started thinking how it could be cool to buy some Mukava-branded swag to wear and give away. 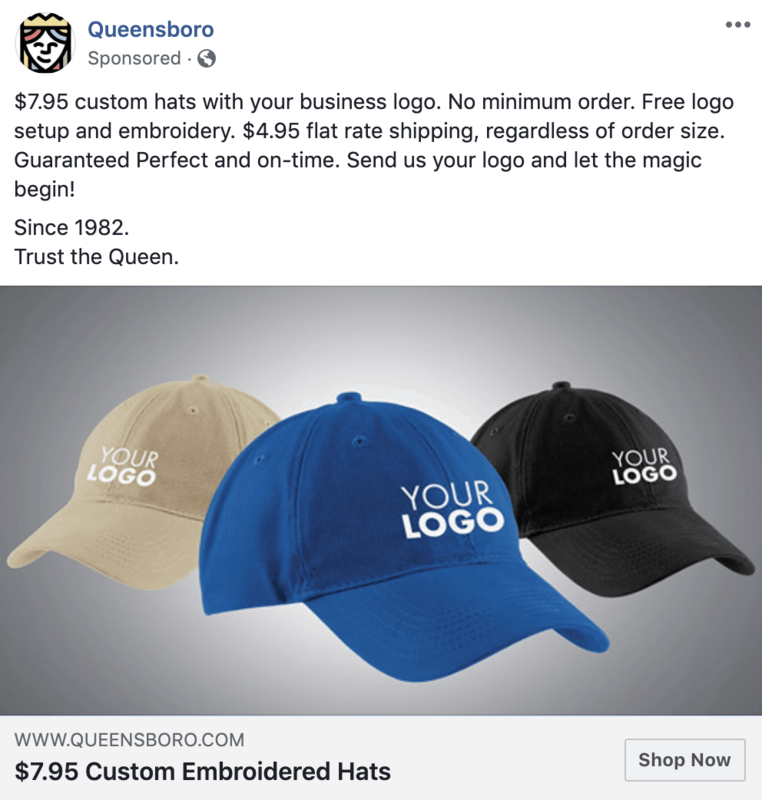 Queensboro.com advertises their custom embroidery service on Facebook. The offer and its copy are both pretty good! The page had a background video of some embroidery machines working, but nothing else above the fold gave me the impression I was in the right place. 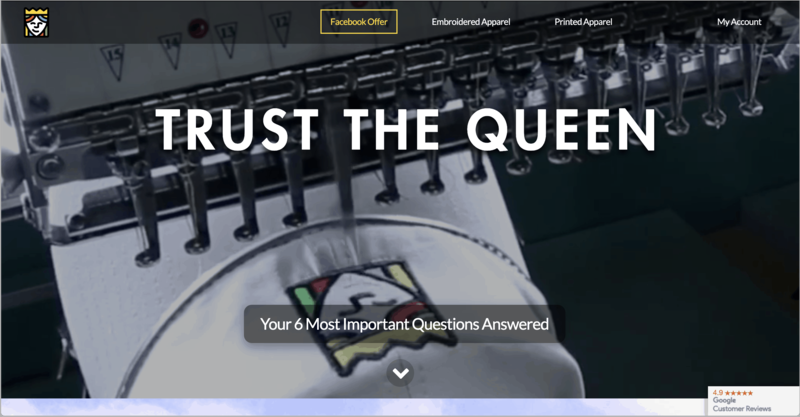 The headline “TRUST THE QUEEN” and “Your 6 Most Important Questions Answered” had nothing to do with me wanting to buy hats! 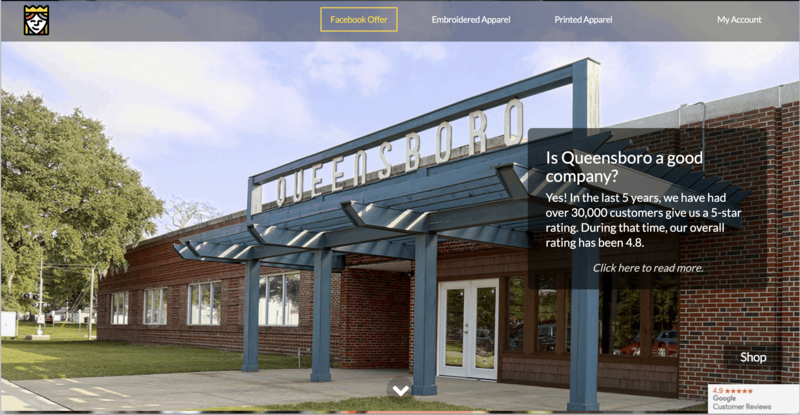 The page was long, it had nine sections/screens below the fold talking about how good of a company Queensboro is, how great their prices are, what the logo will look like (on a hat I presume although they did not mention the word “hat”). They also addressed people’s concerns about if they’re not happy with the purchase or how long it’ll take to receive the order. 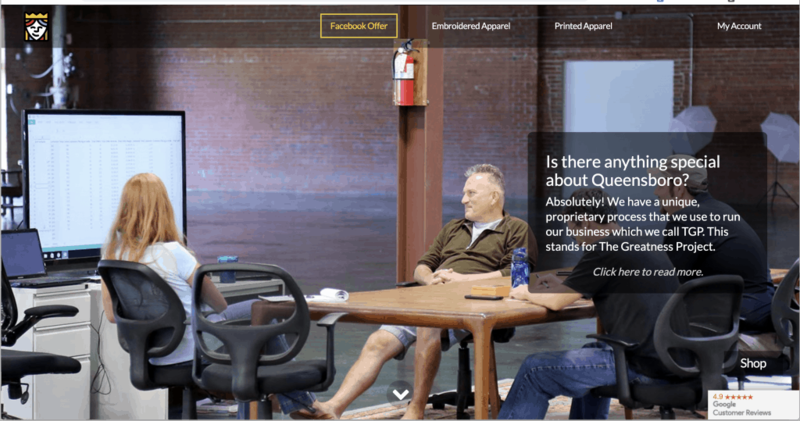 They boasted their proprietary process called The Greatness Project, or TPG, and even mentioned their values and company mission. 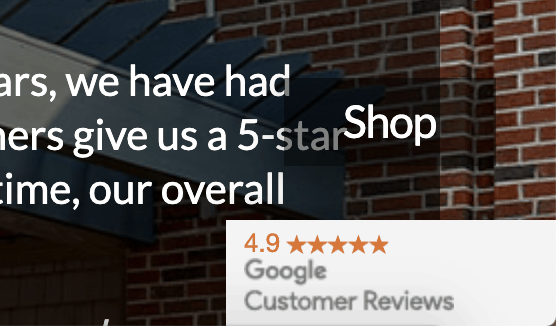 To their defense, the last section displayed two select customer reviews, which is great and something a landing page should have. How can I order hats? Text continues after the screenshots, or click here to jump. Sometimes long sales pages repeat the call to action button at the very end, so I was expecting to at least see a link there. 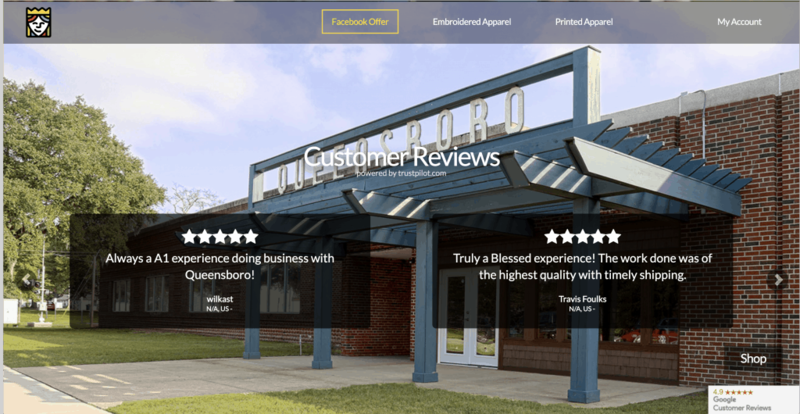 Almost as if Queensboro had decided that by the time a visitor has read every single word on the page and has been convinced of the company’s superiority only then they’re ready to click on the “Buy now” button. Sorry guys, but that’s not how it goes. 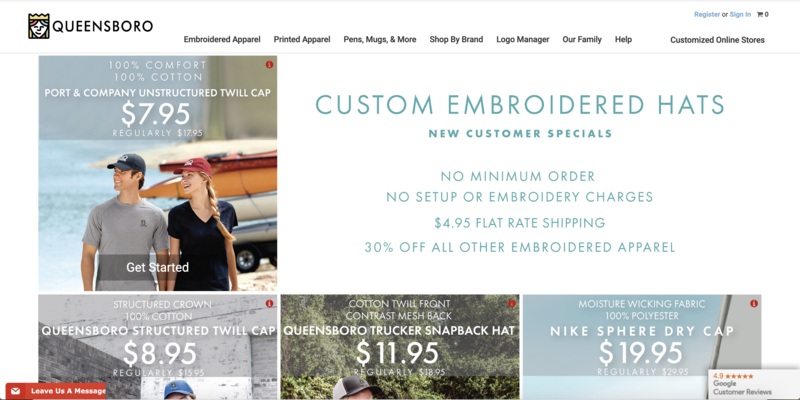 Determined to find how to order hats, I scrolled up and down the page, until I finally saw the “Money button” at the bottom-right corner of the screen. The kicker is that it did not appear by default – a user had to start scrolling down the page for the button to appear. See if you can spot it in the image below. 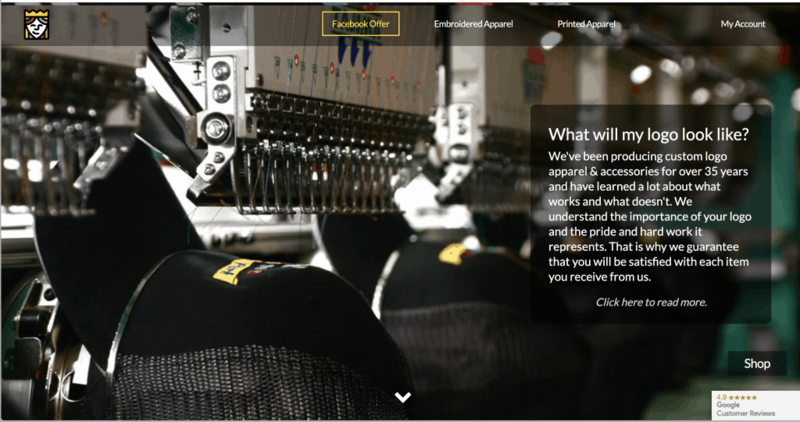 It didn’t say “Buy hats” or “Order your custom hats here.” Instead it just says “Shop” in a semi-transparent black button with white text on an image-rich background. When I clicked on it, Voilá! I landed on a page more along the lines I was expecting to see; It repeats the offer and shows examples of the hats. Much better! A few things I would do differently is to use different text color to increase the contrast between the text and the background. 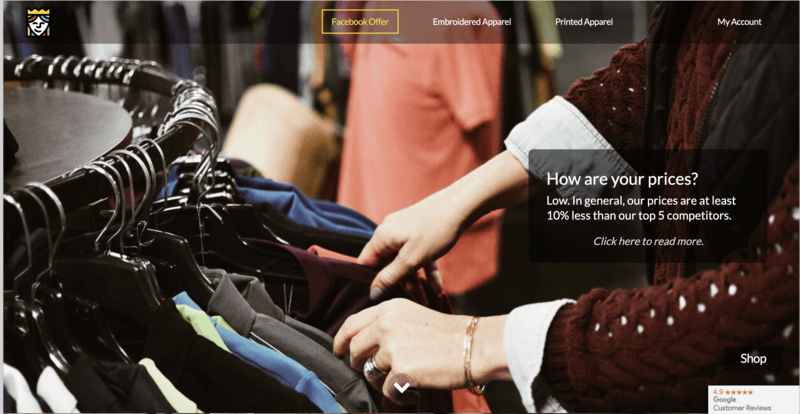 And maybe include a button under the text to enter the store. The copy lets the visitor know they’re in the right place and offers a direct way to buy hats. 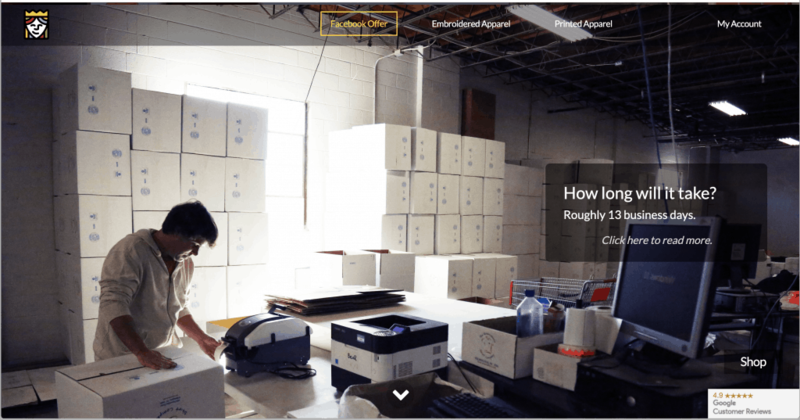 Those who aren’t quite ready to start ordering and want more information to be comfortable, they can peruse the additional content below the fold.